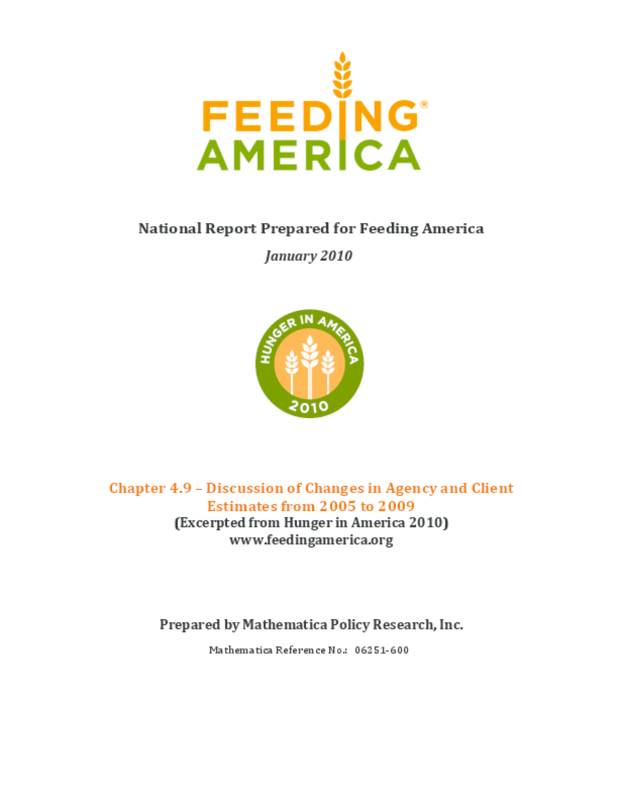 Chapter 4.9 describes changes between 2005 and 2009 in the number of Feeding America clients as well as in several factors that are central to producing the estimates in each year. The number of pantries in the network has increased by 13% and the numbers of emergency kitchens and shelters have decreased by 20% and 14%, respectively, between 2005 and 2009. The annual number of clients served across all three types of programs has increased by 46% since 2005. The average number of household visits to pantries per month (per household) increased from 1.8 to 2.0, suggesting an increase in frequency of use among households. The average monthly percentage of all client households that start using pantries each month -- the newcomer rate -- increased from 14.0% to 20.8%. The average monthly percentage of clients who start using kitchens each month increased from 15.0% to 23.4%. For shelters, the newcomer rate increased from 36.0% to 46.1%.